Get ready to find the new 2019 Honda Pilot in Niagara! Mark your calendars for August 24, when the new Honda vehicle will be arriving at Henley Honda. 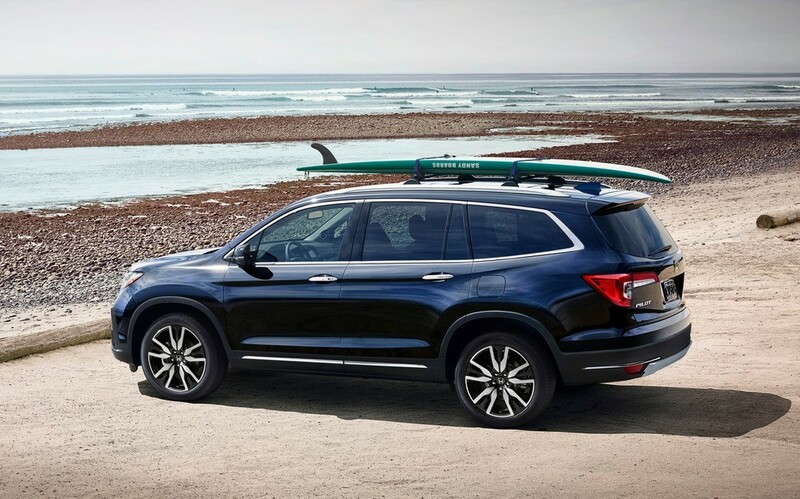 The redesigned and refreshed 2019 Honda Pilot comes with a long list of necessary upgrades, and proactive problem-solving technology to meet needs you didn’t even know you have. Learn more about what’s new in the 2019 Honda Pilot and how it measures up against other vehicles you may be considering. If you haven’t had a sneak peek of what the 2019 Honda Pilot, we promise you will not be disappointed. You might have a hard time believing your eyes because the Pilot has gotten a major face-lift. From the front to the rear, the 2019 Pilot has changed its style to be bolder to handle the Pilot’s robust all-weather driving capabilities. The style of this mid-size SUV from the outside is sleek but safety conscious, with larger LED fog light housing fully integrated into the bumper, and new skid garnish on the lower portion. Additionally, the new Pilot brings the exclusive Black Trim edition which comes with power folding mirrors and automatic dimming. When you purchase or lease the Pilot Black Edition you get the power of hands-free tailgate for the first time ever. Simply kick your foot under the rear bumper and see the tailgate open so you can shop till you drop, without dropping your bags. The interior includes red ambient stitched leather seats, so you’ll be surrounded by luxury every time you step into your new vehicle. Luxury doesn’t stop at leather seats – a panoramic Moonroof and Captains Chairs are available in the new Honda Pilot. Whether its hands-free, WiFi connection, or automation, our needs in our vehicles have changed drastically. The Honda Pilot has thought of everything you need to get to point A to point B while connecting with the people, news, and entertainment that matter to you. Think of the Honda Link as exactly what it says: a link between you and online content. Whether you’re in your vehicle or outside, this service connects through Bluetooth, providing a hands-free link, along with an App for exclusive access. Whether you’re looking for roadside assistance, scheduling an oil change, or looking to get to know your car better with the Honda Pilot Owners Guide. All of this is at your fingertips, moving with you wherever you need it. You asked and Honda Niagara delivered. CabinTalk™ was a loveable feature for our customers who own and lease the Honda Odyssey. Now available in our Pilot Touring or Black Edition Honda Pilot, CabinTalk™ allows you or your front seat passenger to communicate with passengers behind you, in your headphones or both simultaneously. The new Social Playlist feature lets up to seven phones share music on a playlist, eliminating the fighting over the radio forever. You might upload your country music playlist, while your passenger uploads R&B. Now you’ve got a large playlist filled with songs everyone in the car can enjoy, and if you need to change the selected song, you can easily view the Pilot Audio Display and control the list. Trims can create a large transformation in the overall exterior of your vehicle. If you look at most of the vehicles at our Honda Dealership in St. Catharines, you’ll see how trim has been redefined for a more sleek and bold look. If you want the full package of trim upgrades, look no further than the 2019 Honda Pilot Black Edition Trim. So, what does more trims than ever before look like? To get the full idea, visit a Honda dealership in Niagara and see it for yourself, and even take it for a test drive. It has gloss black accents, black wheels, darkened headlights and taillights, and red ambient lighting to match the red accent stitching in the interior. If you want to make sure you are one of the first to get peek of this car before it’s gone, contact us at Honda Henley St. Catharines to speak with a sales representative, who can give you all the insights and get you ready for your test drive.